Γεια σας (Yassas) and welcome! We are Mirella and Panos, a couple from Athens, Greece. All our lives, we have always enjoyed cooking and trying new recipes, new spices, new ingredients! Our friends would very often tell us "you guys are in the wrong job! ", as our professions are -unfortunately- not cooking-related (well, for the time-being!). Mirella’s interest in cooking was inherited from her father Apostolis, who was the “Chef” in the family. Even though her mother cooked more often, her dad was the one who was introducing the family to new ingredients and recipes and spending hours in culinary research. He still does this, to this day. So Mirella grew up learning most of the necessary techniques (and a lot of recipes! ), by watching him preparing wonderful meals for the family. 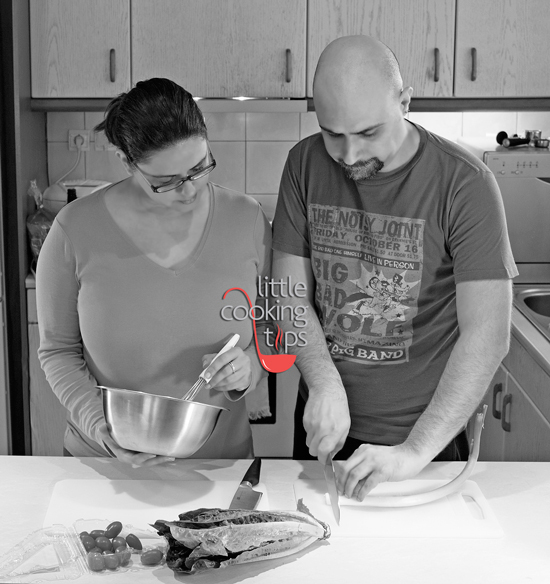 Panos’s interest in cooking was inherited from his mother Eleni and his mother’s side grandparents. Both his grandparents (yes the pappou as well, not just the yiayia) where cooking A LOT of traditional Greek recipes. His grandma Katina was often baking savory pies (like spanakopita, hortopita etc) all the time, as he was growing up, and his grandpa Nikos was often making his own specialties (like rabbit stew, Greek escargot, roasted pork with quinces, squab with caramelized onions etc). His mother Helen continued this legacy, by cooking all these traditional dishes and expanded her skills, making some popular European desserts as well; So it becomes pretty clear, how this environment had a strong culinary influence on him! When we shared our recipes with other people (at the office for instance), we noticed that they were often really excited about trying them. So, we thought, we must be doing something right. The same goes for any people (friends, relatives) trying our dishes. That is why we decided to put all of our recipes in one place, making it easier to share them with everybody! Thus, we created our first tiny blog on Blogger and started publishing them. So, without realizing it much, we became "food bloggers"! Soon, we discovered that the people interested in reading these recipes were A LOT more than we initially anticipated. We didn’t think there would be such interest from around the world for our humble online "cookbook". As a result of this, through the blog, we met people from around the globe and learned countless things about different cultures and cuisines. The best part is, that this is an ongoing process, with much more things to learn, people to meet and flavors to taste(yay!) . We also found out that many Greek dishes and ingredients are unknown outside our borders, which is really a shame, as they taste sooo good. Our recipes are often made with organic ingredients which we prefer to buy locally from smaller shops and family-owned businesses. The reason for choosing organic is not just that they have less chemicals/pesticides residue etc. It's because they taste so much better than the conventional ones! We both grew up with organic fruits and vegetables from our parents' villages (as many Greeks do), so the difference when we're using conventional products is really evident. If you haven't tried organic fruits or veggies before, give them a try; you won't regret it. We cook on our home kitchen, which means that we use an electric stove like most people do here. If you're using gas (lucky you! ), keep in mind that your stove cookes faster than ours:) So you'll need less time to prepare any of the recipes in this blog. Our cooking style is mostly Greek and Mediterranean and we prefer the traditional (perhaps rustic) way of preparing the dishes. Let's just say that if you're looking for authentic Greek recipes you won't be disappointed. Since we love trying out new flavors and ingredients however, we also cook some popular "international" dishes (even though it’s not always easy to find some of the ingredients here in Athens). Let us know what you think of our recipes and feel free to comment, make your own suggestions or request a recipe! Also, if you have a question about Greek food, we' re here to help you out. We saw that our first, tiny blog's visitors had an appetite for something different, something fresh, new. We also wanted to provide more filters for our audience, an easier way to navigate through the recipes. That is why we decided to move on, leave Blogger, and create this website; a fully functional food blog, with much more capabilities, which enabled the visitors to find what they were looking for, using an easier interface. A few more things about us: we love watching comedies like Brooklyn Nine Nine, It's Always Sunny in Philadelphia, South Park (well, at least up to season 12, that is), Family Guy, American Dad and crime shows such as Law & Order, CSI, Castle, True Detective etc. Yes, none of those crime shows is still on, but we keep watching older episodes:) We also like SciFi movies and series and yes, we have watched all the Star Trek episodes, with our favorites series being DS9 and Voyager (dork alert!). So... welcome to Little Cooking Tips! We hope that you'll find our blog useful and you'll enjoy cooking our recipes as much as we do!